Just landed in my mailbox - three Ackworth Quaker Samplers! I'm really excited and wanted to drop everything and start stitching right away (I'm sure you've had that urge) but first things first: decide what linen to use and if I want to go for silk or DMC threads. I've never used silks before, so it would be cool to try the Au Ver a Soie silks! Will have to think about that for a bit, and will get back to you on what I decide! Edit: Jennifer asked me where I purchased these patterns. These were bought at Kunst en Vliegwerk an online shop that specializes in classic samplers and is based in The Netherlands. Lonneke delivers great service and advice, and I love our chats! Eeeeeeeeeek, three more Ackworths!! I'm just dieing a slow death from jealousy here. I love these patterns and someday I will muster up the money to get some. They are so beautiful. If you have the chance to drop me a message as to where you bought them I would greatly appreciate it. Love your new patterns. Quaker samplers are very addictive! Do try Au Ver a Soie silk - you will love it! I must say that I"m quite excited to get started on them as well! 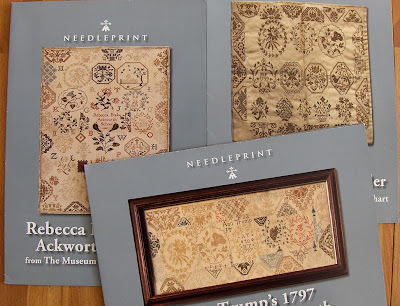 Jennifer: I picked up these patterns at Kunst en Vliegwerk (see add on post for link). Carol r: I am seriously considering Au Ver a Soie silks - just need to find the right shade. Stay tuned to read what I"ll end up with! A friend of mine in the US just told me I had to check out your blog. I am another Heidi in The Netherlands who also loves to stitch and quilt. How kind of you to visit my blog! I'll be visiting your blog as soon as Blogger stops being mean and let's me have a look at yours as well! Who knows? We may not live far from each other!